Before the 5-year-old horse won Saturday at Churchill Downs, trainer John Sadler had an 0-for-44 record in Breeders’ Cup races. One race before the Classic, European superfilly Enable took the BC Turf. 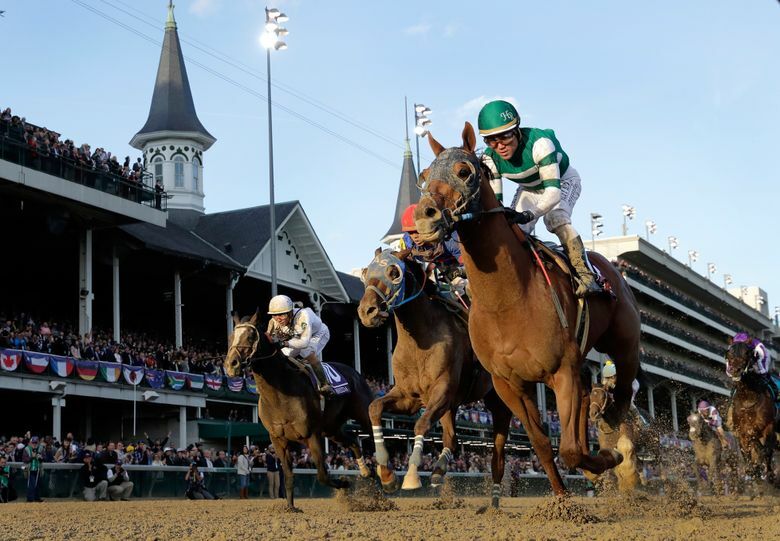 LOUISVILLE, Ky. – Even if he isn’t voted this year’s top North American Thoroughbred, Accelerate all but assured his place as the continent’s best older horse. His signature victory in the Breeders’ Cup Classic should solidify his credentials for multiple honors. Accelerate took the lead near the top of the stretch and held off 30-1 shot Gunnevera to win the $5.358 million Classic by a length Saturday at Churchill Downs, strengthening his bid for Horse of the Year over Triple Crown winner Justify. The Classic lacked the retired 3-year-old superstar and left a competitive field that 5-year-old Accelerate defeated despite breaking from the extreme-outside post in a field of 14 before a crowd of 70,423. Winning trainer John Sadler, a 62-year-old California native, entered the Classic with an 0-for-44 record in Breeders’ Cup races. “I feel like I’m 1 for 200,” Sadler said shortly after Accelerate won. Sadler was a bit reluctant to discuss what ending his slump meant. “If I get caught up in it, I’m gonna cry,” he told Daily Racing Form. Accelerate has won four straight Grade I races. Ridden by Joel Rosario in the Classic, he covered 1¼ miles in 2 minutes, 2.93 seconds and paid $7.40 to win as the favorite. From a global standpoint, the biggest star on the card was 4-year-old filly Enable. She won Europe’s most significant race — the Prix de l’Arc de Triomphe on the turf course at Longchamp in Paris — last year and again last month. Enable won the $3.572 million Turf by three-quarters of a length over Magical. Enable, trained by John Gosden and ridden by Frankie Dettori, covered 1½ miles on a course rated “good” in 2:32.65 and became the first Arc winner to also win the Turf. “She did it today with sheer guts and determination,” Gosden said. There were nine Breeders’ Cup races Saturday, and Dettori was the lone rider to win more than one. He was also aboard Expert Eye ($13.80 to win) in the Mile. Monomoy Girl ($5.60) bolstered her case as the top 3-year-old filly in North America by winning the $1.786 million Distaff. She won the Kentucky Oaks at Churchill Downs in May. “She was training like a monster and ran like a monster,” said Louisville-based trainer Brad Cox, who earned his first Cup victory. Peter Miller made history as the first trainer to saddle two repeat winners in the same Breeders’ Cup races. Soon after Stormy Liberal ($16) outdueled favorite World of Trouble to retake the $920,000 Turf Sprint by a neck, 6-year-old Roy H ($7.40) zoomed to a 3¼-length score in the $1.786 million Sprint for Miller. Most of Saturday’s winners were at least fairly well supported at the betting windows, but an exception was 3-year-old filly Shamrock Rose. She paid $53.80 for winning the $920,000 Filly and Mare Sprint by a head over 14-1 shot Chalon. A summary of the races Saturday at Churchill Downs; payoffs are on $2 win bets.